Come along for the ride as I reflect on the last year. I can’t believe it’s been an entire year since I moved into my own studio apartment! It feels like no time at all, but also as if an eternity has passed since that February day that I said goodbye to my Marina apartment and life with roommates. I thought I’d share the story of why I moved and what I’ve learned on this adventure so far. I always envisioned myself living alone in a big city. I would dream about it in college, using Pinterest to save ideas for my someday apartment. It’s easy to dream and plan, but it’s not that easy to just find the perfect place and be able to afford it in a city like San Francisco where the average one-bedroom apartment costs above $3,000/month. The time came last winter where I was feeling extremely anxious and depressed. Like, crying ALL the time. I was teary-eyed nonstop and couldn’t go a day without breaking down. I think one of the reasons for this was that I wanted to come home to a restful environment, but there was some tension with one of my roommates that I couldn’t seem to shake. A few things had happened and I didn’t feel safe or supported. The one thing I know for sure in this world is that everyone is deserving of a space where they can feel safe and comfortable. So when I didn’t feel that way anymore, I knew it was time for a change. What made this time even harder was that my parents were out of town on a long vacation in New Zealand, so I didn’t have them to retreat to in a time of need. They are usually my go-to shoulders to cry on when I’m feeling down or low, and I’m so lucky that they live so close to me. Even with them gone, I found myself sleeping at their house and commuting from Marin into the city for work because I just wanted to be somewhere that felt comforting and familiar. 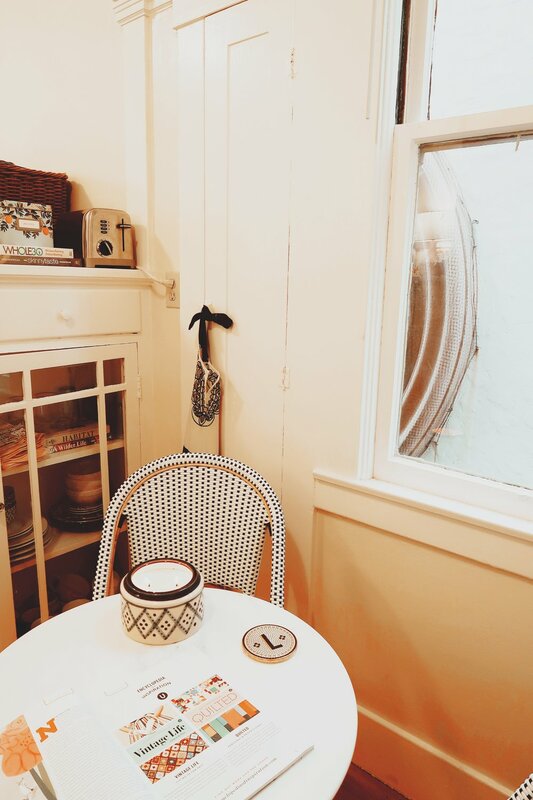 To help with my anxiety, I decided to start looking at studios on Craigslist as a casual activity after work/on the weekends (weird, I know… but it’s oddly soothing to me to visit open houses) and I happened to stumble across one that I really liked. It was in the Inner Richmond, just a block above Golden Gate Park. The building was quaint (only four units) and owned by a sweet landlady who lived in the neighborhood. The unit was actually a true one-bedroom, with the bedroom separate from the living space by french doors. I really liked it and applied on the spot! I felt like such a prepared applicant, with all of my information packaged neatly for the landlord to review. A few days later, I got an email from her. I didn’t get the apartment. I remember sitting in the In & Out parking lot in Mill Valley (no joke) crying on the phone to my best friend Stephanie. This sounds dramatic, but I felt so upset in that moment. Not just about not getting the apartment, but that I felt so alone. That night, I snuggled up in bed and logged back on to Craigslist. I was surprised to find a listing in my budget that was in a neighborhood I was already familiar with. I made a mental note to visit that weekend for the open house. Saturday came and I arrived promptly at 11. The landlord buzzed me up and I immediately felt comfortable in the building. It was clean and relatively small, and in the perfect location. I stepped into the unit and I just knew it was the one. What sold me was actually the view from the kitchen nook: the beautiful rose window of the church next door. I immediately felt this sense of peace, safety and security. After chatting with him for a while, I told him I was going to apply. He called me on Monday and the spot was mine! When I saw this beauty outside of the kitchen nook! I went back to the apartment on Wednesday, this time with my mom who had just returned from New Zealand. When she walked in, she said “Yes — you have to do this!” Her reassurance that this apartment was the perfect fit for me was just the validation I needed. Putting down the security deposit was so scary, and so was signing the lease. I’d done all of this before, but doing it alone was a different feeling entirely. And it was more money than I’d ever paid before for a living space! We dined at my now-neighborhood fave Nopalito to celebrate, which will forever be a special memory. A year has passed and so many memories have been made in my sweet home. I’ve had some hard times too, and lots of tears, but when I look back so far, I’m proud of this special spot I’ve created a home in, and all that it means to me. I can’t even imagine parting with it! I think it’s a place I’ll live in as long as I can… unless something (or someone) totally comes out of left field and knocks my socks off! I hope this insight inspires you to to reflect about what your home means to you. Writing these lessons out made me think of the scenes in the new Marie Kondo show on Netflix, when Marie kneels on the floor of each home and thanks the space for all it has brought its residents. This gesture (and this activity of writing out lessons learned) certainly gives you a newfound sense of appreciation for home. Never take this for granted! I have been through pain and suffering in the past because my home was not safe. I never thought I’d find a place where I wasn’t scared to close my eyes at night, but I finally have. You deserve to go home and rest your head and be at peace. And more than that, your home should be beautiful to you. That doesn’t mean your home needs to be big, or even that everything in it has to be fancy. But home should include the things and hold the memories that make you smile, morning after morning when you wake up. There’s an incredible buzz in the air whenever I have friends over. I think because I have gotten so used to it just being me most of the time, when I have other people swing by it makes me feel like my apartment is the most happening place in all of SF! Plus, it’s really nice to be able to share the beautiful space I’ve curated with others. Whether it’s my mom stopping by for dinner after work on a Friday evening, or a few girlfriends (and maybe a puppy) coming over for wine and a cheeseboard, I find such satisfaction in sharing my home with the people I love most. When I first moved in, literally everything was perfect… except for the fridge. I had this adorable white fridge in the kitchen which matched the rest of the room. The only problem was that it didn’t work. I’d put food in it and the next day, it would go bad. No matter how hard I pressed the “colder” button on the temperature dial, the fridge didn’t want to listen. My landlord was responsive but he told me I should leave my freezer door open overnight to let the fan thaw, and that it’d go back to normal. I tried that… twice. And still no luck. This fridge was a total nightmare. I called him so many times, he finally caved and said it’d be cheaper for him to just get me a new fridge than keep bringing a repair person out. He did reimburse me for the food, thank goodness! And just like that, I had a new fridge that’s dark grey (ugh) but it worked… and still works! At first, I felt kind of bad for complaining. That’s how women are often conditioned — to be afraid of complaining out of fear it will make us look aggressive or annoying. But then I realized, “I am paying WAY too much money per month to live in a place where my food keeps spoiling!” So I persisted and got what I deserved. Now that is girl power! Out of all the time spent in my space this past year, I think my favorite moments are the quiet ones. The ones where I’m in my comfiest clothes, drinking a cup of tea and scrapbooking on my floor. The ones where I’m cooking in my tiny kitchen to Sinatra and Ella Fitzgerald. The ones where I am bare faced with hair in a messy bun, people watching out the window on my couch as I catch up on last night’s SNL. These are the moments I will remember! At some point in my life, I won’t have these moments to enjoy anymore. I’ll live with a partner. I’ll be a mother. I will have responsibilities that I just don’t have right now as a single gal in my twenties in San Francisco. And as much as I want all of those exciting experiences to come my way, I have to be thankful for the fact that right now, it is just me. WANT TO LOVE WHERE YOU LIVE AS MUCH AS I DO? Sign up with your email address for a copy of my FREE ultimate Apartment Checklist. This printable guide includes everything you need to deck out your first ever apartment (or give your existing space the refresh it deserves!) Plus, you’ll receive monthly newsletter updates on home styling & happy living. Thank you for becoming a Bliss Insider! Check your inbox for a copy of my FREE apartment checklist!